In a new documentary, Jay-Z is reminded of his early life in the Brooklyn projects as he sees children playing near open sewers in an Angolan slum. "In my business, we like to say we're from the hood," said the 36-year-old rap superstar, settling in a car to leave the shantytown. "We're not in the hood. By no means. Not even close." "The Diary of Jay-Z: Water for Life" was shown Thursday evening at U.N. headquarters. It airs Nov. 24 on MTV. The film is part of the rapper's partnership with the United Nations and MTV to get young people involved in the world's water crisis. "I was looking for a cause to attach myself to," Jay-Z told the audience packed in the U.N. Trusteeship Council chamber. He decided on water "because it's the most basic need." MTV film crews followed Jay-Z, whose real name is Shawn Carter, while he visited children living without clean water in Angola and South Africa during his worldwide tour this fall. The documentary mixes their stories with statistics that 1.1 billion people have no access to clean drinking water, and more than 4,000 children die every day from diseases related to the problem. In Angola, Jay-Z helped a schoolgirl lug a 20-liter container of water to the one-room shack she shares with six family members. The family has to pay a neighbor who has running water to fill the container twice a day. They make do with that even though the average person needs at least 20 liters a day for basic needs. "It has to be the size of a jail cell," Jay-Z says of the shack. "You have to think about the shame of having to go knock on a neighbor's door just to go to the bathroom." He then followed the girl, Bela, to school past open sewers, and watched teenagers retrieve a basketball from black water, rubbing it off before resuming their game. "You can't even take a deep breath," he said of the smell. A visit to a rural village in South Africa was more uplifting. 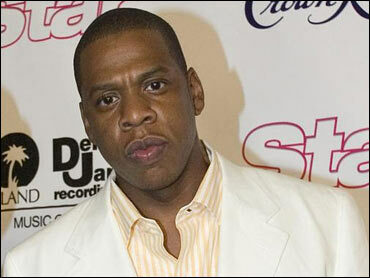 Jay-Z donated a "play pump" that spared children a grueling trip to a water hole. The devices are a sort of merry-go-round that pump water from a well into a storage tank. "So many people that I've seen can't get clean water. It's a crime," he says at the end of the documentary. "I'm on a mission, and I will not forget." Jay-Z, who recently came out of "retirement" to record his new CD, "Kingdom Come," told the audience he would donate the proceeds from an upcoming concert in New York to Water for Life, the U.N. initiative dedicated to meeting a U.N. goal of reducing by half the number of people without safe drinking water by 2015.